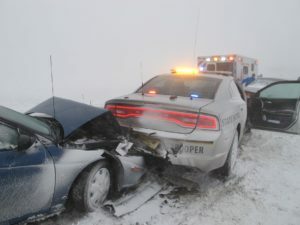 Fewer people were killed in traffic crashes in Iowa last year, but Iowa State Patrol Sergeant Nathan Ludwig says it’s not necessarily because people are being more careful when they get behind the wheel. Statistics from the Iowa Department of Transportation show 318 people were killed in traffic accidents in 2018, down from 330 the previous year. Iowa nearly improved on a low fatality count posted five years ago. In 2013, there were 317 traffic deaths – the fewest since 1944 when there were 310. According to Ludwig, troopers are catching more motorists on interstates who are clocked in the triple digits – traveling at speeds of 100 miles-per-hour or more.